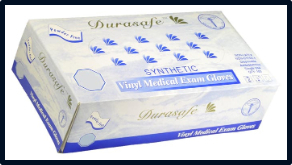 Disposable Vinyl Gloves: Features: - Synthetic Vinyl Gloves. - Powder Free. - Exam Grade. - Color: Yellow or Opaque White. - 100 Gloves per box./1000 case.